Chia seeds were in short supply last fall and I made the huge mistake of letting my Metal horse temperament gelding go without them. Remi had been doing so well with his shoes and fill in pad material that I thought he would be OK without the chia seeds. Not the case. Within 8 weeks of stopping the chia seeds his hoof walls started crumbling again. He also developed some thrush in his right front hoof and this caused his heel to sheer from loss of integrity in his digital cushion. Bottom line, Remi is lame and has been for about a month. I am so bummed. 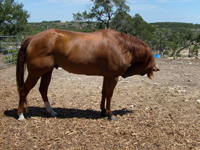 After years of working to get just the right horse feed and supplement combination for him I dropped the ball and let him miss a key component of his program. The chia seeds for the Metal horse temperament supply fat and minerals in just the right balance. The chia seeds also have a bit of a pungent flavor which is good for the Metal horse temperament. Chia seeds are second only to flax seeds in omega 3 fatty acids but chia seeds contain a better mineral profile than flax seeds. Chia seeds have such a good balanced nutritional profile that southwestern Indian tribes use them during endurance contests. Chia seeds also help eliminate dryness in the intestines so they may help prevent impaction colic.